It definitely is beginning to look a lot like Christmas! Right about now is when people start to get really anxious and rushed- those that have procrastinated Christmas shopping that is! Not here in the Main household! I'm a bit of an organization freak (you can thank a number of things...) and very much take after my mom with starting Christmas shopping in...October. Yes, October. This year I made myself wait till November...but still. It's nice though because by the time many people are really starting to get going with present shopping- we're done! Well...I'm done...I'm still trying to encourage my husband to jump on this "awesome" bandwagon with me...he's not as hip to it as I am. I will say though- as of this morning there are now two presents wrapped for me, from him under the tree! Good job! Anyway, one thing I really love to do around Christmas time is make our Christmas presents for our friends. Now before you start thinking "Lame! ", let me explain...These special Christmas gifts use ingredients that are rBST free and organic and locally grown when possible. They also use the best ingredients I can possibly find- we're talking real vanilla beans instead of extract, rBST free sweet cream butter, organic free range eggs, etc. You get the point. These yummy sweet Christmas treats are the best things you can eat! Well the best desserts you can eat at least. So this year I wanted to create a gift they could use together- kind of like a gift package. Each dear dear friend received a jar of homemade, preservative free, natural jam- either Mixed Berry Merlot, Mixed Berry Cabernet, or Strawberry Vanilla Bean...depending on which one we thought the receiver would enjoy most. 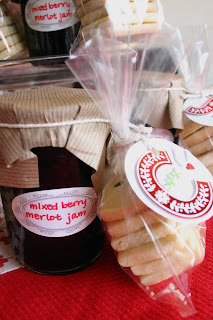 They also were given some homemade Vanilla Bean Shortbread Cookies to go along with their jam. Buttery, crisp, definitely vanilla...these cookies took hours to make and hand place the little holly on top of! We wanted our friends to feel loved and to be able to enjoy something delicious with a unique gift. We hope they did! Merry Christmas to all our friends and family out there! We love you guys so very much! Thank you dearly for ALL your love and support! !